Home > Games > Interactive Games > Make Me a Cake! Dimensions: 7-1/8 x 4 in. 50 game pieces. For ages 3-5. Layer away, and may the best cake maker win! 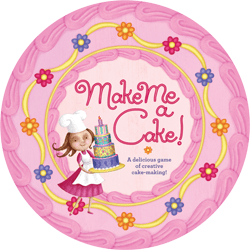 Kids can race to build the tallest, most beautiful cakes in this delectably delightful game for preschoolers. Make Me a Cake! comes in a gift-ready, sparkly, cylindrical cake box package and includes more than 50 different beautifully illustrated cake pieces. Young children can play with friends or by themselves, using the game as a puzzle. Delicious fun!